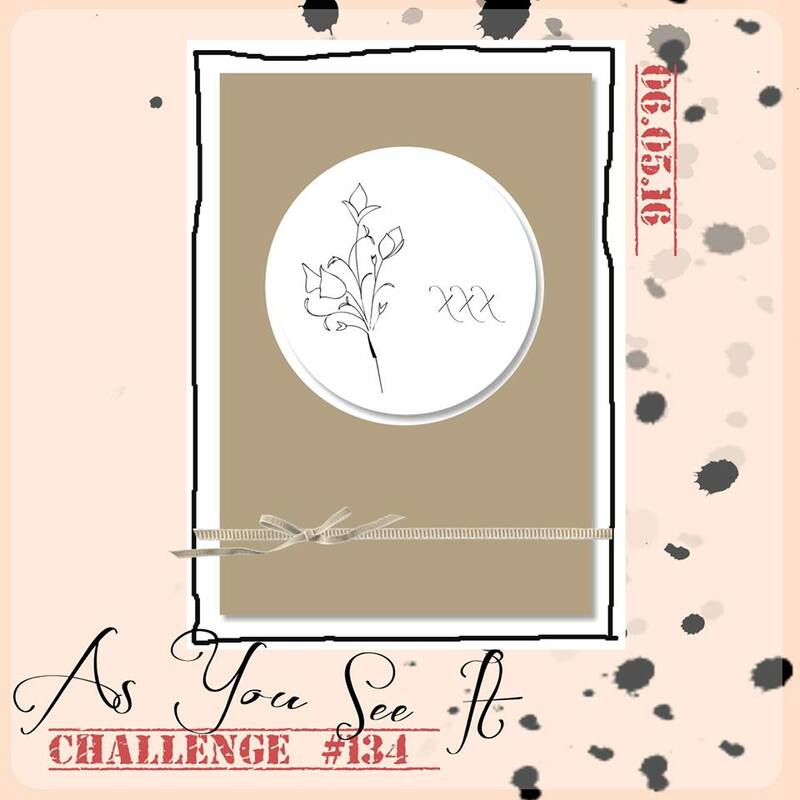 So, Day 12 of daily migraines! This is getting old really fast. I just want to curl up somewhere and sleep for a week of oblivion! My meds will kill the migraine but not until half the day is over, and then I'm just very fatigued after that. But I have a class to give and one to prepare for, and of course, As You See It Challenges to design for. 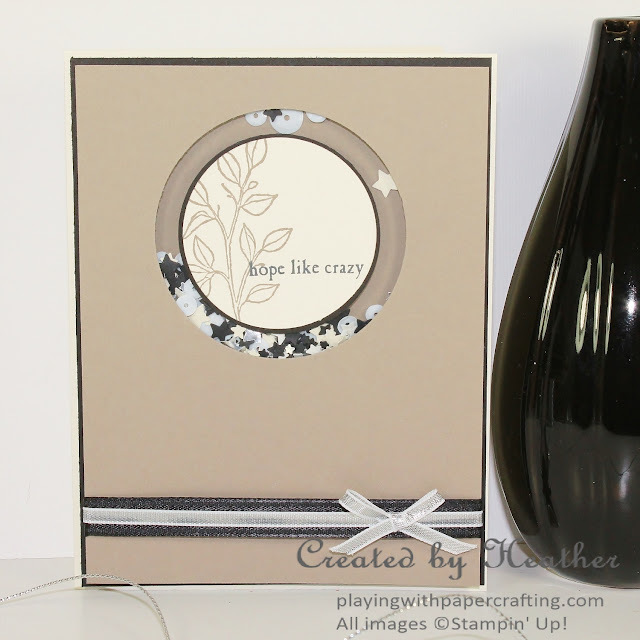 This great sketch is perfect for creating a shaker card. They are very easy to do, once you understand the principle behind it. I punched a 2 1/2" hole in the front panel and glued a window sheet (acetate) on the back, covering the hole. Then I added some self-adhesive foam around the perimeter of the hole on the back as well. I added sequins, and stars punched out using the Confetti Stars Punch from a Silver Foil Sheet and a piece of Basic Black cardstock. 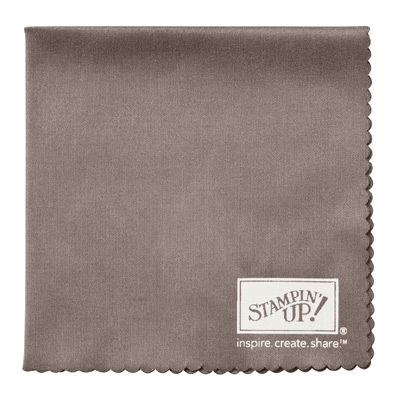 Finally, I peeled off the film from the foam and glued a 3" x 3" piece of Tip Top Taupe over top of all of it. This forms an enclosed shaker compartment. Then all you need to do is adhere it to the card base. 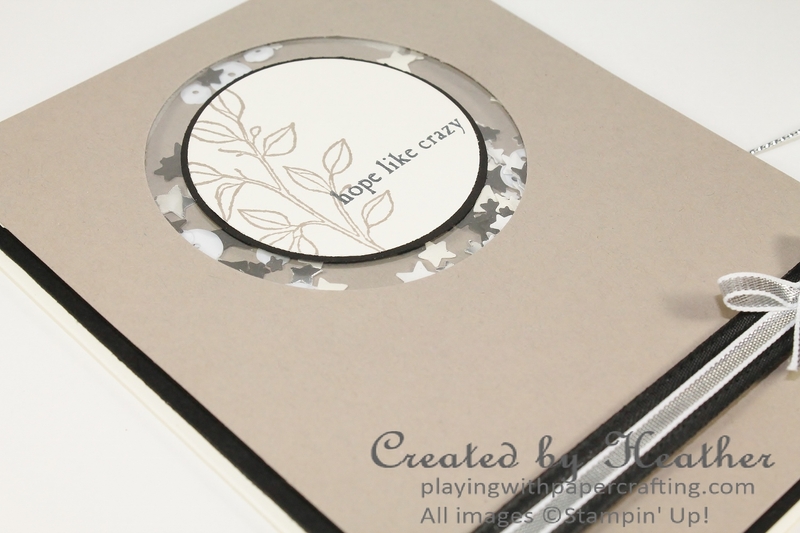 The sentiment panel is die cut using one of the Circles Collection Framelits which is just a bit smaller than the 2" Circle Punch. I stamped it with an image from the retiring Choose Happiness stamp set, and a sentiment from the Picture Perfect stamp set (which is not retiring). I backed the sentiment circle with a 2"circle of Basic Black and used some liquid glue to adhere them, and then to add them to the middle of the acetate sheet as shown. Have you ever had adhesive get on your window sheets? If so, you know how hard it is to remove. The adhesive remover only smears it worse, but Stampin' Up! has a product that will actually remove it: The Clear Block cleaning cloth! Just rub it with that and the adhesive will come right off. That's it for today! 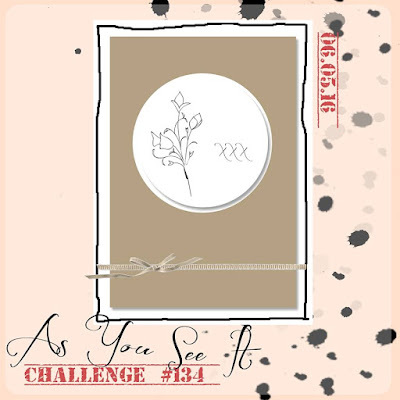 Go on over to As You See It Challenges for a look and why not enter the challenge this week! Have a great weekend!